Fran Uhler Natural Area. Monthly walk. Meet at 7:30 am at east end of Lemon’s Bridge Road, off Route 197 just north of Bowie State University. No reservations needed. Contact Bill Sefton (kiwisuits@msn.com) for more information. Lake Artemesia Natural Area. Semi-monthly walk. Wheelchair-accessible. Meet at 3 pm at parking lot at intersection of Berwyn Rd. and Ballew Ave. in Berwyn Heights. No reservations needed. Contact David Mozurkewich (mozurk@bellAtlantic.net) for more information. The Legacy of Bud Taylor, presented by Dr. Matthew Perry. Our region lost an esteemed wildlife artist when John W. Taylor died last October at age 86. Known to all as “Bud,” he was a beloved and treasured member of MOS and the Anne Arundel Bird Club. An accomplished wildlife artist, his career started with commissions from the National Geographic Society and the National Wildlife Foundation, leading to his self-employment as a wildlife artist. He authored two books published by Johns Hopkins Press: Birds of the Chesapeake and Chesapeake Spring, and designed Maryland’s first deer and trout stamps and was selected as the artist for Maryland’s first Waterfowl Stamp in 1974. He won the Duck Stamp contest in 1979 and was selected in 1984 as the winner of the Florida Duck Stamp contest. His life and work were documented on Maryland Public Television’s Maryland Outdoors. His later years were spent painting in his studio, working primarily with oils. Dr. Perry, emeritus scientist at Patuxent Wildlife Research Center and long-time friend of Bud, will share Taylor’s influence on protecting the Chesapeake Bay landscapes, even beyond his well-known paintings. “Many were educated by Bud and carried his message to Annapolis and other political venues to help improve the quality of the Bay,” said Perry. “He was a man with a conscience who was quick to discuss the importance of quality habitat.” Come learn more about this multi-faceted man and his impact on conservation. About the presenter: Dr. Matthew C. Perry is an Emeritus Scientist (Retired Wildlife Research Biologist), with the United States Geological Survey – Patuxent Wildlife Research Center, in Laurel, MD. He is the author of numerous scientific publications. While employed at Patuxent, he conducted research dealing with waterfowl food habits and management of wetland areas, among other projects. Dr. Perry remains active as a lecturer, writer, and naturalist for bird tours. Governor Bridge Natural Area. Monthly walk. Meet at the Natural Area parking lot on the south side of Governor Bridge Rd., 1 mile east of Route 301. No reservations needed. For more information contact Bill Sefton at kiwisuits@msn.com. Annual county-wide census of resident and migrating birds. This census is part of a state-wide effort to count fall birds. Pick your own start and stop times. Contact the county compiler David Mozurkewich (mozurk@bellAtlantic.net) to receive an assigned area and for more information. Sunset pontoon boat trip on the Patuxent River at Jug Bay to observe Sora and other rails, Least Bittern, maybe some migrating songbirds, and other specialties of this freshwater wild rice marsh. The boat will depart the dock promptly at 4:30 PM. Meet at the boat launch area of Jackson’s Landing at Patuxent River Park, Croom, MD. Trip will be led by Naturalist Greg Kearns of Patuxent River Park. Boat fee: $5 for residents of Prince George’s or Montgomery Counties; all others $7. Come early for bathroom stop, and have $5 (or $7) cash ready. Limited to 20 participants; for reservations (required) contact Marcia Watson (marshwren50@comcast.net). Open to members of the Patuxent Bird Club and Prince George’s County Audubon Society only, except as space may be available. Lake Artemesia. Sponsored by Prince George’s Audubon Society, Maryland-National Capital Park and Planning Commission, MOM’s Organic Market. 5th annual migration-themed birding festival with live raptors and 11:00 am raptor talk; 7:30 am bird walk for all skill levels; 10:00 am family bilingual scavenger hunt introducing iNaturalist app; children’s games, crafts, coloring mural, bilingual Spanish/English activity pages, make recycled binoculars; spotting scope set up; Monarch butterfly migration life cycle display, Wood Thrush display. For more information, contact Lisa Bierer-Garrett at froglipp@gmail.com. South Tract of Patuxent Research Refuge. One of a series of walks to explore the seasonal variations in bird use of the habitats at South Tract. Be prepared to walk up to 2 miles. Wear sturdy shoes and bring a water bottle. Target species include migrating warblers, flycatchers, vireos, sparrows. Meet at 8:00 am in the parking lot of the National Wildlife Visitor Center off Powder Mill Rd. ; bear left on entering the parking area and go all the way to the last section of the lot past the covered solar recharging station for electric vehicles. For directions, see https://www.fws.gov/refuge/Patuxent/visit/directions.html. For further information, contact the leader, Ken Cohen, at kvulture@aol.com. Saving the Places You Love, presented by Ned Tillman. Naturalist, outdoor guide and environmental author Ned Tillman will give a spirited presentation about how to protect and preserve the places that we and our feathered friends like to visit. Ned has used fiction and nonfiction, workshops, presentations, blogs, and interpretive walks to inspire people of all ages to fall in love with the outdoors and to become better stewards of these fragile lands. His hope is that each of us will become more effective champions of the wild spaces in our midst. His book, Saving the Places We Love: Paths to Environmental Stewardship, describes the major campaigns that have been waged to preserve the forests and parks all across the country. It was the 2014 Book of the Year as selected by Howard County’s Poetry and Literary Society, Community College, and Library System. He will have copies of his books and will be happy to sign them for you at the meeting. If you wish to read them ahead of time, they are all available on Amazon. About the presenter: Ned Tillman, a life-long Maryland resident, lives in Howard County on Lake Elkhorn. He has served as the Chair of the Howard County Conservancy and the Howard County Environmental Sustainability Board, and has been on the board of the Izaak Walton League of America and the Maryland Academy of Science. His books are used widely throughout Maryland in the Master Naturalist program, as well as in schools and colleges. He has spent the last 12 months visiting threatened habitats for key species. Ned’s first book, The Chesapeake Watershed: A Sense of Place and a Call to Action, is about the region where we live. It won the 2010 Excellence in Journalism Award chosen by the Renewable Natural Resource Foundation and was named the 2010 Best Book on Environmental and Natural Resources by The American Society for Public Administration. His latest book, The Big Melt, is a novel that inspires the reader to take more actions to help reduce the impacts of a changing climate. Patuxent River in Southern PG County. This trip will visit a few less-birded areas along the Patuxent focusing on sparrows and other late migrant songbirds. The route will depend on what areas have good habitat this year. Bring a lunch/snacks since we will not finish up until early afternoon. Meet at 7:30 am at the small parking area near the historic flying field (Columbia Air Center) memorial near the end of Croom Airport Road. Please RSVP to the leader, David Mozurkewich, (mozurk@bellAtlantic.net). Point Lookout State Park. We will explore the varied habitats of Point Lookout in St. Mary’s County with a focus on songbirds, migrating hawks (maybe! ), and waterfowl. Brown-headed Nuthatches are a specialty of the park. Bring lunch and snacks since we will not finish up until early afternoon. Meet at 9 am at the Park Store at 10560 Point Lookout Rd, on the right as you enter the park, after the causeway. Please RSVP to the leader, Marcia Watson (marshwren50@comcast.net), who will provide more information to you in advance of the trip. Note: Park entry fee of $3/car (MD resident) or $5/car (out-of-state resident). Birding Trinidad and Tobago, presented by Martyn Kenefick. Home to 482 species of birds — not forgetting 68 different bats, 45 snakes, 50 spiders, 30 frogs and toads, 120 dragonflies, 765 butterflies and close to 3,500 moths — the islands are an introduction to the natural history of South America. Birders can get a taste of tropical birding in Trinidad’s high mountain rain forests, sandy beaches with nesting turtles, and mangroves with Scarlet Ibis evening roosts, as well as on Tobago’s seabird nesting islands and huge protected preserves. The Asa Wright Nature Centre is a perfect jumping-off spot for field trips, and is itself set in 200 acres of forest and is home to more than 170 bird species. Renowned for on-site access to specialties including Bearded Bellbird, Tufted Coquette and Oilbirds, the Centre offers a birding veranda where it is possible to observe more than 40 species before breakfast! The Centre is a not for profit trust, and eco-tourism funds the Centre’s conservation and education programs. For nearly 40 years of the Centre’s 50+ years existence, Caligo Ventures has been the booking agent for North America. Fully committed to the conservation and education mission of the Centre, Caligo is pleased to sponsor Martyn’s visit to celebrate and highlight this bucket-list birding destination. About the presenter: Having been an avid birder since early teens, Martyn Kenefick moved to Trinidad in 1999 and spent the next 15 years working as a bird tour leader for a number of companies, guiding in Trinidad & Tobago and many other countries. In 2007, he became the main author of the Birds of Trinidad & Tobago Field Guide, the 3rd edition of which will be published by Yale University Press early in 2019. Martyn joined the Board of Management of the non-profit Asa Wright Nature Centre in 2015 and is now Chair of the Conservation & Education Committee. Blackwater NWR. Meet at the Bowie Park and Ride at 8:00 am to carpool to Blackwater for wintering waterfowl, eagles and other raptors, lingering shorebirds and songbirds. Please RSVP to the leader, Ken Cohen, at kvulture@aol.com, in advance. Piscataway National Park. Field trip to this National Park Service facility on the Potomac River in the southwest corner of Prince George’s County, for wintering waterfowl, gulls, and songbirds. Meet at the fishing area at the north end of Wharf Road at 8:00 am. From the DC Beltway (I-495), go south on Route 210/Indian Head Highway, then right (west) on Farmington Rd. West. Continue on Farmington Rd. to a sharp curve to the left, where you should turn right (north) onto Wharf Road (large wooden sign at intersection reads “Farmington Landing”). Follow Wharf Rd. to its end at the fishing area/boat launch. Contact the leader, David Mozurkewich, (mozurk@bellAtlantic.net), for more information and car-pooling options. Annual Holiday Social and Movie Night. Join the Patuxent Bird Club and Prince George’s Audubon Society for popcorn and other refreshments to enjoy during our annual movie night. Featured film will be “High Tide in Dorchester.” Produced by the Bay Journal, “High Tide in Dorchester” is a film that encourages discussions and actions concerning sea level rise, erosion and climate change in Dorchester County, MD. The film creates a powerful, intimate story that looks at a worsening global threat through the lens of Chesapeake Bay’s most vulnerable county. Other short films may be added. Special guest Dave Curson, Interim Executive Director/Director of Bird Conservation at Audubon Maryland-DC, will join us to discuss the work that Audubon and its partners are doing to protect the marshes in Dorchester County from the impact of sea-level rise. 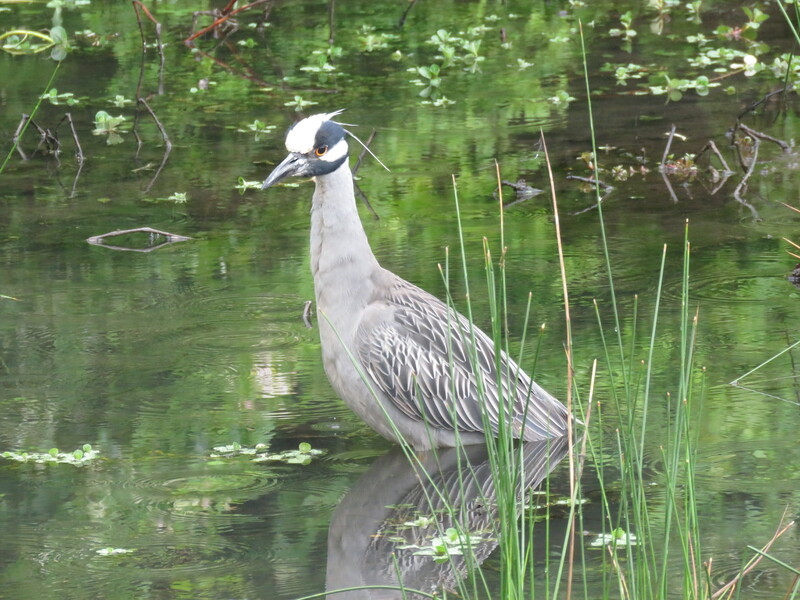 Volunteers are needed to census birds in a 15-mile diameter circle centered near Jug Bay, spanning from Upper Marlboro in the west to the Chesapeake Bay in the east. The circle covers parts of Anne Arundel, Prince George’s, and Calvert counties. Choose your own start and stop times, then come to a tally rally at the end of the day to share your data and socialize. Contact compiler Marcia Watson (marshwren50@comcast.net) to be put in touch with a sector leader to receive an area assignment. South Tract of Patuxent Research Refuge. One of a series of walks to explore the seasonal variations in bird use of the habitats at South Tract. Be prepared to walk up to 2 miles. Wear sturdy shoes and bring a water bottle. Target species include migrating warblers, flycatchers, vireos, sparrows. Meet at 9:00 am in the parking lot of the National Wildlife Visitor Center off Powder Mill Rd. ; bear left on entering the parking area and go all the way to the last section of the lot past the covered solar recharging station for electric vehicles. 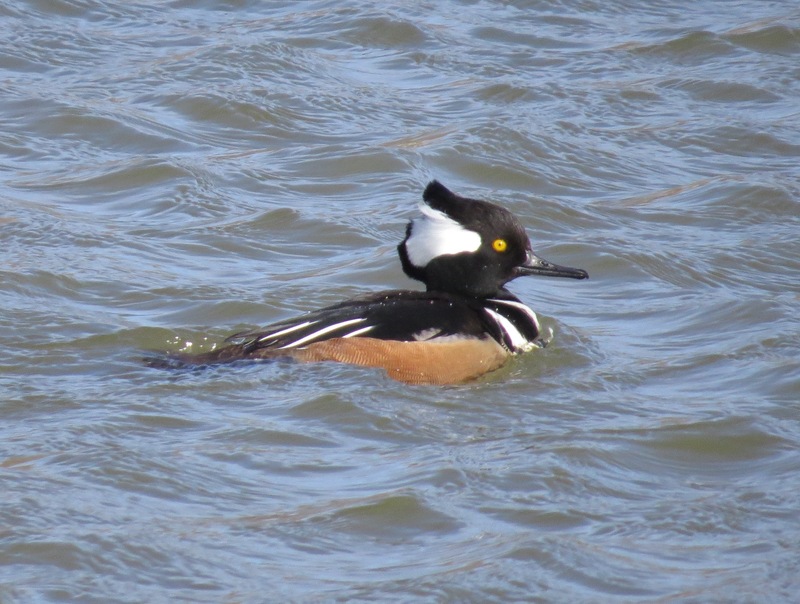 For directions, see https://www.fws.gov/refuge/Patuxent/visit/directions.html or see https://www.mdbirdingguide.com/Patuxent_Research_Refuge_South_Tract. For further information, contact the leader, Ken Cohen, at kvulture@aol.com. Volunteers are needed to census birds in a 15-mile diameter circle in the vicinity of Bowie. Choose your own start and stop times, then come to a tally rally at the end of the day to share your data and socialize. Contact compiler David Mozurkewich (mozurk@bellAtlantic.net) to volunteer and to receive an assignment. Lake Artemesia Natural Area. Semi-monthly walk. Wheelchair-accessible. Meet at 3 pm at parking lot, at intersection of Berwyn Rd. and Ballew Ave. in Berwyn Heights. No reservations needed. Contact David Mozurkewich (mozurk@bellAtlantic.net)for more information. Fran Uhler Natural Area. Monthly walk. Meet at 7:30 am at east end of Lemon’s Bridge Road, off Route 197 just north of Bowie State University. No reservations needed. Contact Bill Sefton (kiwisuits@msn.com). About the presenter: Andy Brown has been a Naturalist with Calvert County for 32 years. He received his degree in Wildlife Biology from Frostburg State University. Andy conducts research projects on Barn Owls, Saw-whet Owls, American Kestrels, and Eastern Bluebirds, and is beginning a partnership with the Eastern Motus Wildlife Tracking Collaborative this winter (https://motus.org/). He has held a bird banding license since the age of 16. Andy grew up in Forestville, MD, where he cut his birding teeth with Prince George’s Audubon Society, and has fond memories of participating in many of the regional counts in his teenaged years. Andy’s interests include all forms of wildlife (particularly birds and sea turtles), hiking, and kayaking. Andy began leading nature tours for groups in the early 1990’s, and he founded Caretta Nature Tours in 2010. Bladensburg Waterfront Park and Anacostia River Trail. The park and trail offer excellent habitat for wintering birds, including gulls, sparrows, and other passerines. The newly opened Anacostia River Trail extends south from Bladensburg Waterfront Park, passing an old landfill site that has now been restored as a grassland, with an adjacent restored freshwater marsh. This is the site that hosted a Harris’s Sparrow last winter. Meet at 8 am at Bladensburg Waterfront Park, 4601 Annapolis Road (Route 450) in Bladensburg. For more information about the site, see https://www.mdbirdingguide.com/Bladensburg_Waterfront_Park. Drive in through the gate and go all the way to the farthest parking area, near the office building and kayak launch site. For more information, contact the leader, Ross Geredien, at goodmigrations@yahoo.com. Lake Artemesia Natural Area. Semi-monthly walk. Wheelchair-accessible. Meet at 3 pm at parking lot, at intersection of Berwyn Rd. and Ballew Ave. in Berwyn Heights. No reservations needed. Contact David Mozurkewich (mozurk@bellAtlantic.net) for more information. What Marsh Wrens Can Tell us About Evolution: Lessons from Color, Sound and Genes, presented by Dr. Sarah Luttrell. It’s easy to imagine new species forming in isolated places like remote islands, but what about right in your own backyard? The fact is, the basic processes are happening in every generation in every species, but they are typically slow and subtle. Dr. Luttrell’s work aims to better understand how evolution works by studying subspecies of the Marsh Wren (Cistothorus pallustris). Bird subspecies, distribution, and natural history have been well defined by hobbyists and professionals alike, making them an ideal group for understanding evolution. She will talk about how comparing multiple traits including plumage color, size and shape, vocal behavior, and genetics in Marsh Wrens has revealed an exciting pattern of evolution in this widely distributed coastal marsh bird. About the presenter: Sarah Luttrell is originally from central Ohio, where she grew up enjoying nature and the outdoors and became interested in birds in high school. In college she was lucky enough to be mentored by an excellent ornithologist who helped her hone her interest in birds into an ability to ask scientific questions about patterns in nature. Sarah completed her doctorate at University of Maryland Baltimore County in August 2018, studying the patterns of evolution in a widely dispersed species, the Marsh Wren. Studying Marsh Wrens took her to marshes all over the eastern U.S., where she gained a deep appreciation of the animals that survive in tidal marshes and the stories they may be able to tell us about evolution in this unique ecosystem. She recently started a new position with the Feather ID lab at the Smithsonian National Museum of Natural History and is excited to be able to spend more time birding and exploring outdoor areas in her adopted home in the Mid-Atlantic. Weekend Trip to Ocean City. This trip offers the opportunity to see a variety of birds – land and sea – not found in spring and summer, and takes advantage of off-season rates and reduction in crowds and traffic. Target birds include alcids; sea ducks including Long-tailed, Harlequin, eiders, and scoters; gulls; Northern Gannet; Great Cormorant; grebes; both Red-throated and Common Loons; and winter songbirds. Pack your woolies and join us. RSVP required. Contact field trip leaders Marcia Watson and Gene Scarpulla at marshwren50@comcast.net no later than February 8 for itinerary, hotel information, and trip reservations. North on the Wing—Travels with the Songbird Migration of Spring, presented by Dr. Bruce Beehler. In this illustrated lecture, naturalist and ornithologist Bruce Beehler will recount his hundred-day-long 2015 field trip following the spring migration of songbirds from the coast of southeastern Texas up the Mississippi and thence into the boreal forests of northern Ontario— breeding ground of many of the beautiful and vocal North American wood warblers. Along the way, Beehler visited various migratory bird field projects as well as scores of local, state, and national parks and refuges critical for the preservation of the migration phenomenon. He also spent time in an array of eclectic and beautiful rural communities from southern Louisiana and Mississippi through the Heartland and to the northern limit of roads in Ontario, land of the Cree and Ojibwe First Nations peoples. Beehler’s informal goal was to spend time with all thirty-seven eastern wood warblers on their prime breeding habitat. In pursuing this objective, he saw a lot of deeply rural North America. His presentation touches on wildlife, nature conservation, migration research, American history, and rural culture. Beehler will be signing his popular book, North on the Wing (Smithsonian: 2018), after the lecture. Seasons at South Tract. Half-day walk. One of a series of walks to explore the seasonal variations in bird use of the habitats at South Tract. Be prepared to walk up to 2 miles. Wear sturdy shoes and bring a water bottle. Target species include early migrating songbirds and maybe some lingering waterfowl. Meet at 8:00 am in the parking lot of the National Wildlife Visitor Center off Powder Mill Rd. ; bear left on entering the parking area and go all the way to the last section of the lot past the covered solar recharging station for electric vehicles. For directions, see https://www.fws.gov/refuge/Patuxent/visit/directions.html or see https://www.mdbirdingguide.com/Patuxent_Research_Refuge_South_Tract. For further information, contact the leader, Ken Cohen, at kvulture@aol.com. Lake Artemesia Natural Area. Semi-monthly walk. Wheelchair-accessible. Meet at 6 pm at parking lot, at intersection of Berwyn Rd. and Ballew Ave. in Berwyn Heights. No reservations needed. Contact David Mozurkewich (mozurk@bellAtlantic.net) for more information. How to use eBird to increase your life list!, presented by Ross Geredien. Have you heard about eBird but never had the chance to sit down and learn how to use it? Or perhaps you are a beginning eBird user but have never gotten beyond the basics of submitting data? Then this program is for you! Ross Geredien will give a primer of the different data and information tools available in eBird, including how to submit your data; how to find recent bird sightings; how to locate target birds; how to do research for an upcoming bird trip; managing your lists in eBird; and other questions based on the audience’s interest. We will cover tools like species maps, bar charts, personalized species needs alerts, species occurrence frequency, birding “hotspots,” and range maps, as well as a brief overview of the eBird mobile app. We won’t be able to cover everything, and so we will focus on some of the most fun aspects of eBird, like how to use it to increase your life list/state list/county list! About the presenter: Ross Geredien has had an interdisciplinary career in the fields of environmental science and conservation that includes service in state and federal government as well as the nonprofit sector. He has worked for the U.S. Department of Agriculture, Maryland Department of Natural Resources, and the U.S. Environmental Protection Agency, where he regulated high-profile mining projects as well as hydraulic fracturing. In addition, Ross has managed conservation lands with The Nature Conservancy in Maine and the Mianus River Gorge Preserve in New York; lobbied Congress to strengthen loopholes in the Clean Water Act; started his own nature photography business; worked as a park ranger and naturalist in Denali, Olympic, and Everglades National Parks; and founded a nonprofit association to protect forest land in Annapolis, Maryland. Ross holds a Master of Environmental Management degree in Ecology from Yale University. He speaks fluent Spanish and has traveled extensively in Latin America. He has been birding for 28 years and has led bird walks throughout North America. His birding resume includes many types of avian surveys, including volunteering with the Cornell Lab of Ornithology in Arkansas’ White River delta to search for the Ivory-billed Woodpecker. He serves on the board of Directors of the Patuxent Bird Club. He is a self-described “power-user” of eBird, which he has used extensively since 2009. Fort Smallwood Hawk Watch. We will car-pool to Fort Smallwood Park in Anne Arundel County to observe the spring raptor migration spectacle. Data for the spring raptor migration are compiled annually by a team of counters organized by Sue Ricciardi from the Anne Arundel Bird Club. The number of raptors counted in a spring season ranges from 9,000 to 12,500, and fifteen different raptor species are usually observed, though not all may be present on any one day. In recognition of the significance of the hawkwatch, Fort Smallwood Park has been named an Important Bird Area by Audubon Maryland-DC. Migration of non-raptor species is also noteworthy, especially waterfowl, swallows, and Blue Jays and other passerines. About 260 species of birds have been observed at the Park. Bring folding chair, hat, sunglasses, sunscreen, drinks and snacks. Also bring cash for daily parking fee of $6.00 per vehicle (annual passes are also available for $30 for Anne Arundel County residents or $40 for non-Anne Arundel County residents; a lifetime pass is available for $40 for those aged 60 years and older). Meet at the Bowie Park and Ride at 7 am. No reservations needed. Contact David Mozurkewich (mozurk@bellAtlantic.net) for more information. In conjunction with our May meeting presentation by Joan Cwi on Chimney Swifts (see May 14 below), the Baltimore Bird Club has invited us to join them for their annual swift watch at dusk. The swifts have been returning regularly to the Bookbindery Chimney in the Hampden area of Baltimore, so that is where the BBC will probably hold the watch again this spring, 2019. BBC members will observe the chimney the week before, and should it not be productive, a change of venue will be posted on the BBC website (www.baltimorebirdclub.org) and Facebook page (www.facebook.com/groups/382565775136349/members/). Be sure to double check the location! If cloudy or a drizzle, come a half hour early. Canceled if raining. Binoculars useful but not necessary. Hope to see you there! Leaders: Joan Cwi (jafjsc@verizon.net) and Alice Nelson (alice.display@verizon.net). Meet for car-pooling from PG County at the Bowie Park & Ride at 5:15 pm. Or, if you wish to drive directly to Hampden, here are directions: Take I-97 or I-295 or I-95 to the Baltimore Beltway (I-695) and get on the Inner Loop to go north toward Towson. From the Beltway, take Exit 23 for I-83/Falls Expressway southbound. From I-83, take Exit 9 for Cold Spring Lane eastbound. Go east on Cold Spring to Keswick Road (about 1.0 mile or 5 traffic lights). Turn right and take Keswick south for 1.3 miles to 33rd Street. Turn right (west) on 33rd Street, then left (south) on Elm Avenue. Follow Elm Avenue to the end where it curves to the left and park in the Mill Center parking lot. Then walk back up to the Bookbindery, across from the chain link fence. If using GPS, search for 3100 Elm Avenue. Annual county-wide census of resident and migrating birds. Pick your own start and stop times. Contact the county compiler Fred Fallon at fwfallon@ymail.com to receive an assigned area and for more information. Click here to download a printable checklist for submitting data for the May count. Although the hummingbird is the closest taxonomic relative to the swift, swifts certainly did not inherit the hummingbird’s “pretty” genes. But these plain, little birds are extraordinary in so many ways. The Chimney Swift is the only swift that migrates to the Eastern US, so we will discuss this particular species in regard to anatomy, speed, dexterity, nesting and migration based on sixteen years of research and observation. During the Baltimore Bird Club’s migration swift watches, we have counted as many as 7,000 Chimney Swifts entering a roosting chimney in less than an hour! To see the Swifts in action, don’t miss the Baltimore Bird Club’s Chimney Swift Watch on the evening of May 5 (see details above). About the presenter: The first decade and a half of Joan’s adult life was devoted to studying and subsequently teaching medieval art history at the collegiate level. Naturally, she then spent the next three decades as a survey methodologist for health-related studies. And in the decade since retirement, she has dedicated herself to birding, travelling extensively throughout North and South America for this purpose. She has been an active Baltimore Bird Club member during this time, including a six-year tenure as President. For the past sixteen years, she and two other birding colleagues have sponsored spring and fall swift migration watches for Baltimore Bird Club. Joan is the past committee chair and editor of MOS’s Maryland/DC Birding Guide (https://www.mdbirdingguide.com), and brought the Guide to life as a website. Delaware Bayshore. Full day trip. Join leader Fred Fallon for our annual Memorial Day weekend shorebird hunt at the great refuges of the Delaware Bayshore. Migrating shorebirds are the main target species. We can also expect to see gulls, terns, some waterfowl, and waders. Exact route and stops will be determined by current bird reports and by tides. Bring lunch, snacks, drinks, hat, sunglasses, sunscreen, scope, and money for tolls and possible dinner stop. Reservations required. Carpool will leave from the Bowie Park and Ride at 7 am. Please contact Fred Fallon at fwfallon@ymail.com no later than May 19 to reserve your spot, and for more information. Members’ Night. 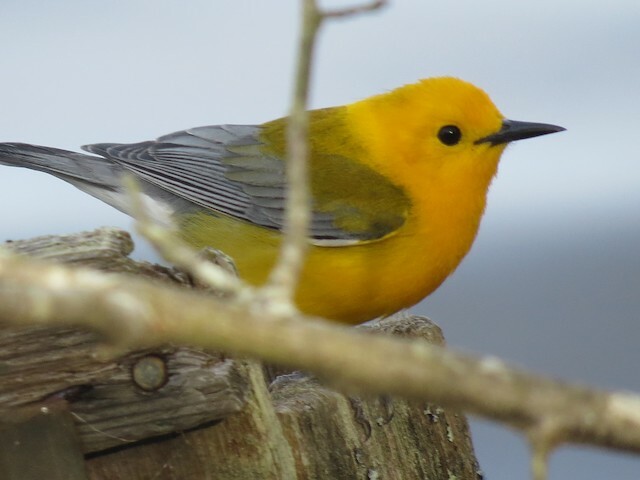 Join members of the Patuxent Bird Club and PGAS as they present a few of their favorite photos and give brief presentations about their birding adventures. Members who wish to present must contact Marcia Watson at marshwren50@comcast.net no later than June 4 so that she can organize the agenda. Free and open to the public. Doors open at 7 pm for 7:30 pm meeting start time. The regularly scheduled bird walk at Lake Artemesia Natural Area will not be held because of July 4th festivities at the site. Fran Uhler Natural Area. Monthly walk. Meet at 7:30 am at the east end of Lemon’s Bridge Road, off Route 197 just north of Bowie State University. No reservations needed. Contact Bill Sefton (mailto:mkiwisuits@msn.com). Lake Artemesia Natural Area. Semi-monthly walk. Wheelchair-accessible. Meet at 6 pm at parking lot, at intersection of Berwyn Rd. and Ballew Ave. in Berwyn Heights. No reservations needed. Contact David Mozurkewich (mozurk@bellAtlantic.net) for more information). Fran Uhler Natural Area. Monthly walk. Meet at 7:30 am at the east end of Lemon’s Bridge Road, off Route 197 just north of Bowie State University. No reservations needed. Contact Bill Sefton (kiwisuits@msn.com). Delaware Bayshore. The trip will visit Bombay Hook and other refuges along the shores of the Delaware Bay, with a focus on migrating shorebirds, waders, and passerines. Bring spotting scope, sunscreen, bug repellant, water & other drinks, lunch and snacks. Long pants, long-sleeved shirt, and closed-toes shoes recommended. Meet at 9:00 am at the Visitor Center at Bombay Hook. (directions available from leaders). Leaders will be Marcia Watson and Gene Scarpulla. Please RSVP to Marcia (marshwren50@comcast.net) no later than August 7 so that they have a headcount and know who to expect.